It's Couture Week in Paris, where the Spring 2015 Haute Couture shows have been laying on the luxury. A quick rundown of some royal favorites today, and an opportunity to gaze at some pretty and pick your wish list for sightings on the royal runway. Click the designer names to see the whole collection. Always the royal favorite, we're sure to see some of this on display at some point. This collection starts with Russian-inspired patterns which remind me of Crown Princess Mette-Marit's ability to take any folk art-type thing and give it a Scandinavian flair, and ends with some gowns that take the romance a bit too far by indulging in actual words flying across the fabric (something which always and forever feels gimmicky to me). 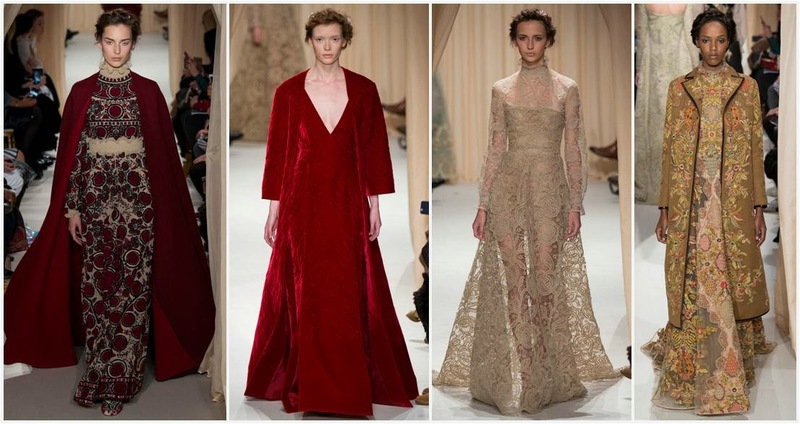 The romantic angle does get me wondering if we'll see any more Valentino couture royal wedding gowns in 2015, though. Finally, we must note that there's plenty here that would make Sheikha Mozah happy, and there ought to be since the Qatari royal family owns the company. I'm not sure midriffs and millinery have ever coexisted anywhere as much as they do in this season's Chanel show, but I am now officially eager to see what Princess Caroline and crew make of their next hat-wearing occasion. I know some of you like to use the dependability of Elie Saab as a mark against his collections, but that's why I love them - always, without fail, pretty. We have some larger scale patterns this season, which are a nice break from the smaller scale and overall embellishment we've seen in past couture shows. There are some major gowns on display, gowns that make me wish the next Nobel Prize ceremony was next month instead of next December so Crown Princess Victoria could bring the label back up on stage. But a more likely appearance for these gems will be on the Luxembourg ladies, so let's get some gala occasions for them ASAP. Giambattista Valli's got the florals that make Mette-Marit's knees go weak. Ulyana Sergeenko has outfitted Sheikha Mozah in the past. Ditto for Ralph & Russo. I'd like to see the Duchess of Cambridge try out this UK-based label, but this collection doesn't feel much like her. Can't say I'm a big fan of the latest from Christian Dior, but most of what we see on the royal ladies (mainly Princess Charlene and Queen Mathilde, thanks to Dior's Belgian designer) is bespoke anyway. And more! Indulge in the pretty on your Friday.